Give your classroom effective teaching by the master teachers with ProTeach. These engaging videos, built on a solid Christian worldview, will guide your 12th grade class in an excellent education in language studies, an absolutely vital skill to have! Prepare your student for college literature studies through the study and analysis of Beowulf, Macbeth, Pilgrim’s progress, and Pygmalion. Even though grammar will not be the focus of the course, daily practices will still be given to help your students stay sharp and ready for college work. 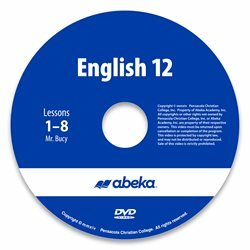 With this monthly rental you will be able to use the DVDs and let the master teacher help your students improve their communication skill through an excellent and systematic study of this language. As your students become acquainted with the students on the video, they will feel as though they are a part of the class. The master teacher will even pause to give “students watching” a turn to participate. While enjoying the fun and expanded learning of ProTeach, your students will have the benefit of your guidance in the classroom as you administer quizzes and tests or check their daily work.